Bug sweep services are a very important and worthwhile consideration when you're running a business that performs any sort of research and development. Timing is so important in business and if your competitors become aware of your concepts and/or future products and services, this can allow them to steal a march on you. Or perhaps you are in the midst of securing a big-money client for your business? Competitors may become aware and try to steal the client from under your nose. These are definite nightmare scenarios for businesses and their shareholders; yet all these risks can be significantly reduced with proper counter surveillance. If you are beginning to question the security of your business, you may have floated the question, is my office bugged? There is a high chance that the question was met with a range of dismissive views and answers from your fellow colleagues. Some people can see spying as the realm of 'James Bond' or MI5. While surveillance is undoubtedly part of the way our security services operate, they're certainly not the only practitioners. Private investigators up and down the country will carry out spying for clients on daily basis. Sometimes, it can be for matrimonial reasons; but it can often be used by businesses who, for example, are suspicious of particular employees taking a large number of sick days off, for instance. Surveillance happens all around you. You probably don't even notice it – and that's the point. When it comes to business, matters can be extremely sensitive. It's not unheard of for rival companies to steal a march on their competitors by using questionable methods to obtain leaked information. Often, this can be via employees who talk too much, sometimes in return for 'gifts', or because security has become sloppy. By and large, these situations often involve the people around you. For this very reason, it's extremely important to avoid any McCarthyism or 'red scares' as this can cause division within the workplace and will damage trust between you, your fellow colleagues and employees. The most logical step, therefore, is to ensure that the places and devices that are used to share sensitive information are secure. And this is where a sweep for hidden cameras and bugs can prove very worthwhile. Can An Electronic Sweep Actually Get Results? Absolutely. An electronic sweep can bring about the strongest proof that you are being spied on – as often it will leave a physical or digital print. When it comes to, for example, visual or in-person surveillance, you're left guessing as to whether that person was taking photos of you or whether they were tourists. When a bug, a hidden camera or active remote viewing software is found, there's no question about it: someone is watching or listening to you. However, proving that your suspicions were right isn't the only reason why you should employ bug sweeping detection services. The whole process can allow you to plug any gaps in your current security policies and procedures. This will give you, and your colleagues, more peace of mind. It's also important to consider regularly employing a bug sweep expert for periodic check-ups. Not only can this save you money, but it can make security procedures more habitual. Without consistent reappraisal of both physical and digital security, things can get slack. The mere presence of a good counter-surveillance company performing periodic checks on your premises can help remind your team to be sharp and vigilant to any breaks in procedure. If the company you hire has a lot of experience, that can only be beneficial. This experience with corporate customers allows them to suggest strategies that have helped other businesses better safeguard their intellectual properties. One such company offering such experience is Advanced Sweeping – which has been operating for 20 years from the heart of London. When it comes to discretion, flexibility, affordability and experience with counter surveillance, you will be hard pressed to find any bug sweep company better than Advanced Sweeping. We put our clients at the heart of our operations. If you need us to come in after hours, evenings or on weekends to maintain confidentiality, then that's exactly what we'll do. To find out more about the services we can provide for you, please head to http://sweeping.co.uk/. 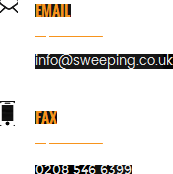 To get in touch you can either email us via info@sweeping.co.uk or you can submit your details on our online form. We'll reply to you as soon as possible.